No Buffalo athlete ever made a larger impact in a shorter period of time than Cookie Gilchrist. He went from star to legend in record time. That’s the main reason why his name will be placed on the Wall of Fame at New Era Field. The ceremony will be held on Oct. 29. Gilchrist joined the Bills before the 1962 season. He was something of a “Plan B” acquisition, since the team had hopes of signing Heisman Trophy winner Ernie Davis of Syracuse for its backfield. But Davis went with the Cleveland Browns, and Buffalo added Gilchrist, a star in the Canadian Football League, instead. Gilchrist had left high school at the age of 19 to sign with the Browns, but a league rule prevented him from making the roster. So he went to Canada to play while waiting for a chance to come back to play in America. The big fullback led the AFL in rushing with 1,096 yards, a career high, in 1962, and came close to that number in his next two years in Buffalo. Gilchrist scored a total of 35 touchdowns in that time. His play helped the franchise rise in the standings, capped by a championship in 1964. The fullback not only was big at 6-foot-3 and 251 pounds, but he was fast. Gilchrist certainly could have played both ways, at almost any position. How many players have kicked field goals and returned kickoffs in the same season? Cookie did it in 1962. But Gilchrist always seemed to have a chip on his shoulder – sometimes with good reason, sometimes not. He was a big part of the legendary boycott by African-American players at the AFL All-Star Game in New Orleans in 1965 over hotel accommodations in that then-segregated city. 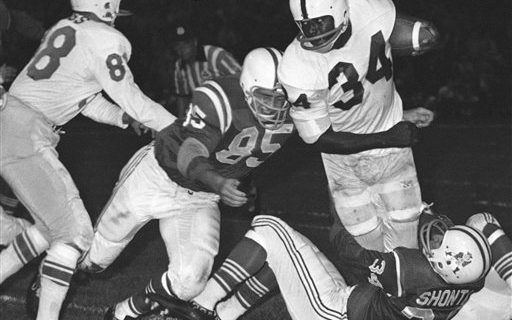 Cookie also became upset with Bills’ coach Lou Saban in 1964 when a game plan emphasized passing, and the running back staged a one-man strike for a brief period of time. Saban eventually ran out of patience, and Gilchrist was traded to the Broncos for a much less valuable fullback, Billy Joe. Cookie had one last great year in Denver before his skills faded away. The chip stayed on his shoulder for the rest of his life. Gilchrist stayed angry with almost everyone he encountered in his football career. He turned down an invitation to be inducted into the CFL Hall of Fame, and he demanded to be paid if the Bills wanted to put him on their Wall of Fame. It took his death early in 2011 for him to start to receive honors locally. Gilchrist was picked for the Greater Buffalo Sports Hall of Fame in 2011. Now, he’ll be the 31st name on the Wall.